You might say Lindsay Lohan was right on target with her machine-gun shooting nun in "Machete." Director Robert Rodriguez believes the troubled starlet could actually return in her own movie based on her outrageous performance in the film, which opens Friday. "It could be the-nun-with-the-gun is back," Rodriguez tells PocornBiz. "She could get her own spin-off." "Of course we've talked about it," he adds, speaking of Lohan. "To be continued." 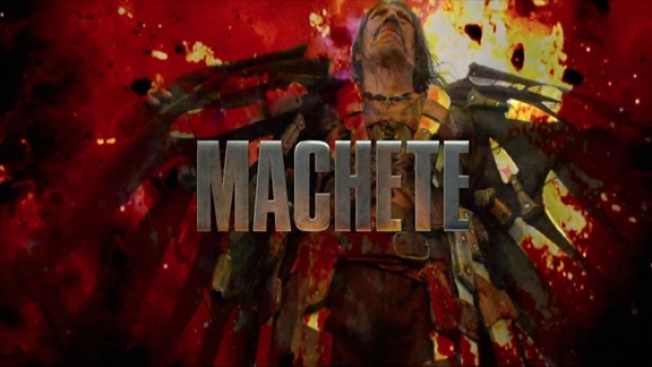 To be fair, Rodriguez is eying a number of surviving characters from the movie for spin-offs or to be part of already promised "Machete" sequels. But there was something compelling watching Lohan on the big screen wearing a nun's habit and spraying a machine gun with a look of total competence. Lohan also gleefully mocks her own public image as a drug-using spoiled daughter who yearns to be a model. Rodriguez confesses that he wasn't even planning on having Lohan use the machine gun in the movie. "I said I wanted to do some shots with her, not even for the movie, but for the trailer with the machine gun," says Rodriguez. "The thing just took on a life of its own. We thought it was so fun." Lohan and her machine gun went on to have a key role in the end of the movie. And the door is open for more firing. "It just got stranger and stranger," he laughs. "She really lights up the screen."